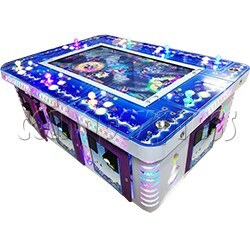 Ocean King 3 Plus: Crab Avengers Video Fish Hunter Game 8 players is a latest game machine from Ocean King series fish hunter game series released by IGS, features in advance the difficulty level to Level 30, add a new crab feature called Smash Hammer and additional of powered up feature fish called Mystic Dragon in 3D graphic display. Crabs will become larger and odds up to 30% for crabs. Ocean King 3 Plus: Crab Avengers game board is available for 6 players, 8 players or 10 players cabinet for option. Ocean King 3 Plus: Crab Avengers is following on from the attractive Ocean King 3: Dragon Power fish hunter game from ocean king 3 series, comes with all old fish hunters features and loaded with all new characters and game features. In Ocean King 3 Plus: Crab Avengers fish game, it is suitable for 6 ~ 10 players, they can all control the joystick and buttons on each control panel, to battle it out to catch as many of the 28 fish characters as possible within the game’s time frame.